The very first Vogue Living in the Netherlands has launched international. With a Vogue Flower Market in the fashionable Corso Como café in Milan during the interior and design fair Salone del Mobile the first Vogue Living was unveiled. 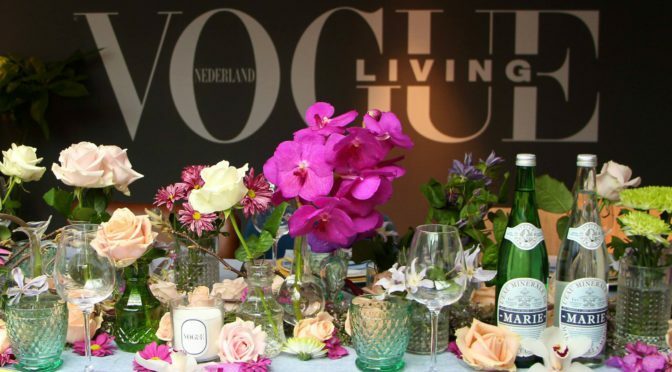 In the Netherlands, the Vogue Living launch was celebrated with press and invited guests during a Vogue Housewarming. Outside guest heard the tunes of the DJ already and once inside they were welcomed by flowers in Vogue’s Flower Shop. On Wednesday, April 20th, Vogue opened a Pop-Up Flower Shop for one day in X Bank in Amsterdam. 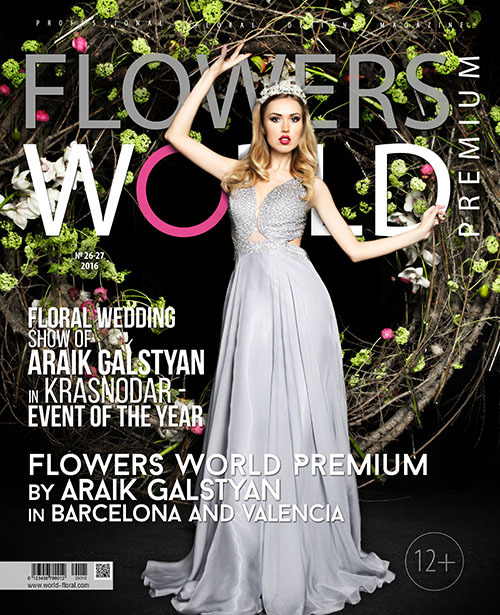 The flowers for the festive occasions in Milan and Amsterdam were selected by LM Flower Fashion in collaboration with Vogue. The ‘Vogue roses’ by Meijer Roses, a selection of flowers by Marginpar, Magnolia blossom of My-Blush, Hydrangeas by Vollering, peonies by My-Peony, chrysanthemums of Zentoo, Cymbidium by HVS Orchid, Phalaenopsis plants of Sion, Vanda plants by Anco pure Vanda and green plants by Vireo Plants were styled during the launch in Milan and Amsterdam. «Personal interiors with a fashion feel. Because that is Vogue and that is what we want to show you, never fashion and living were retracted so close together,»said Karin Swerink, editor in chief of Vogue Living. The magazine features the New York apartment of supermodel Helena Christensen, the Paris dream home of Rosemary White and James Bond house of Nekkele Strings in Amsterdam. And many inspiring pages to keep, for you never know. This combined with beautiful interviews and private moments at home. Bella Hay in bath, at home with Nikkie Plessen, Jasper Krabbe in his studio and Sergio Herman in his Belgium home in Knokke. And of course all the latest interior and shopping trends are featured in Vogue Living, composed a new wardrobe. Altogether Vogue Living is wonderful inspiration! «Flowers play a large role in my life. They brighten up literally every moment and every event. The Vogue parties are also popular for its many fragrant roses, aka Vogue roses. I want the biggest, most beautiful and fragrant roses that can be found in the country. We can not have an occasion without the roses collection of Meijer Roses», the inspiring words of Karin Swerink on a page in Vogue Living filled with images of the ‘Vogue roses’ Meijer Roses. During the launch of Vogue Netherlands in March 2012 the Meijer Roses Avalanche collection was selected and styled by LM Flower Fashion as a fashionable rose that formed the ‘Vogue’ letters, blooming with roses on the canal in Amsterdam. This has become an iconic image. Meijer Roses is the modern rose nursery that is specialized in the growing of the large-flowered rose and bred successfully the white Avalanche, the soft pink Sweet Avalanche and champagne-colored Pearl Avalanche. The combination of these three most beautiful Avalanche roses were in Vogue in recent years occasions. 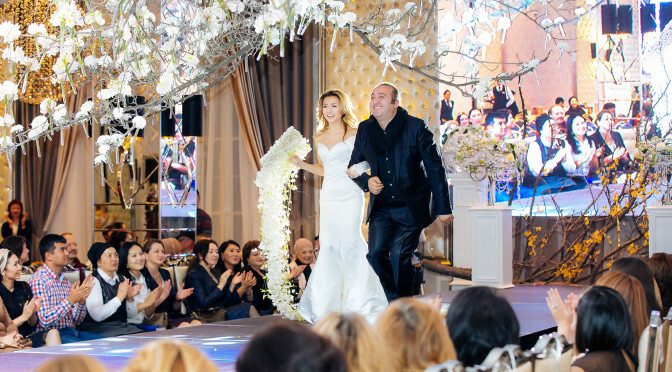 The ‘Vogue roses’ were styled as a symbol of the Romantic Revolution campaign, photo shoots, Vogue Queens Ball, the Vogue Fashion’s Night Out editions and now during the launch of Vogue Living. In this edition of Vogue Living the Meijer ‘Vogue’ Roses are featured and LM Flower Fashion together with Vogue also selected Vanique No.3 gift box of Anco pure Vanda, Phalaenopsis Top Model Collection of Sion and the book Visionary Floral Art and Design’ by flower rockstar Jeff Leatham. The very first Vogue Living in the Netherlands has launched international. With a Vogue Flower Market in the fashionable Corso Como café in Milan during interior and design fair Salone del Mobile the first Vogue Living was unveiled. 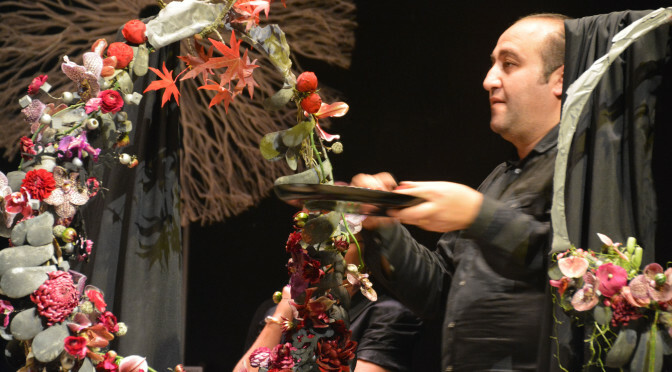 Inspiring people behind the Italian fashion houses Gucci and Dolce & Gabanna but also Vogue Italia and Vogue Australia were surprised with Dutch flowers. intimate companionship, as it were a table at a wedding, decorated with flowers. On Wednesday, April 20, Vogue opened a one day Vogue Pop-Up Flower Shop at design store X Bank in Amsterdam. When customers were buying a Vogue Living they recieved a bunch of flowers ‘wrapped in custom made vogue paper’ as a gift! A huge success with moments when there was a row of Vogue fans in front of the store. The flowers for the festive occasions for Vogue Living in Milan and Amsterdam were selected by LM Flower Fashion in collaboration with Vogue. The ‘Vogue roses’ by Meijer Roses, a selection of flowers by Marginpar, Magnolia blossom of My-Blush, Hydrangea by Vollering, peonies by My-Peony, chrysanthemums of Zentoo, Cymbidium by HVS Orchids, Phalaenopsis plants of Sion and Vanda plants by Anco pure Vanda were styled for the launch in Milan and Amsterdam. For the Vogue Housewarming in Amsterdam green ‘Green is All’ plants by Vireo Plants were styled. Anco pure Vanda proudly introduces a number of new varieties of Vanda orchids in their collection. The colorful collection of exotic flowers is enhanced with Vanda Sunanda Chestnut Spots, Vanda Sunanda Yellow Henna, Vanda Sunanda Magenta Glitter, Vanda Nitaya Rosy, Vanda Nitaya Plum Gorgeous, Vanda Nitaya Tweed Blue Vanda Vanda Sunanda Tayanee Maxi Blue and Sandy Spots. Anco pure Vanda introduces a number of new Vanda varieties in theircollection! Vanda flowers ‘Sunanda’ are characterized by flowers with a pattern of many dots. New to the range are the red Vanda Sunanda Sunanda Chestnut lighting, the light yellow Vanda Sunanda Yellow Henna, the bright pink Vanda Sunanda Magenta Glitter and the brass color Vanda Sunanda Sandy Spots. The ‘Nitaya’ Vanda flowers are characterized by monochrome Vanda flowers. Added to the Nitaya collection are the pink Vanda Nitaya Rosy, the purple Vanda Nitaya Plum Gorgeous and blue Vanda Nitaya Tweed Blue. The ‘Tayanee’ Vanda flowers are known of its compact smaller Vanda flowers. The new blue Vanda Tayanee Maxi Blue has the characteristic smaller Vanda flowers but on a large branch with many flowers. One of the most special orchid genera is the Vanda. It is an almost mystical orchid, one who lives in the air and has, among other flowers in a color that is substantially not present in the nature, blue. Vanda originates on the southern slopes of the Himalayas and in the area from India to southern China. The orchids grow high in the trees of the forest. With its long roots the plants put themselves stuck in trees, the roots are feed on morning dew and rain. In the Netherlands the plants and flowers are grown successfully by Anco pure Vanda. Their Vanda orchid collection is available worldwide in a wide variety of species. Color, flower and plant shape differences within the various species, that makes the Vanda so attractive. For everyone is a variety of Vanda to find that suits his or her home. At the end of 2015 Anco pure Vanda introduced VANIQUE® no.3, a unique gift box consisting of three exclusive Vanda flowers in a luxurious package. By providing a specially designed tag the wrapper of the gift box is available with a logo with text applicable in corporate identity. An elegant gift that exudes beauty as attractive accessory in every interior. VANIQUE® no.3 will also be available featuring the latest Vanda flowers.